The lockscreen shortcuts can indeed be customized. They are linked to the 4 shortcuts at the bottom of the home screen, and whatever you change those to, the lockscreen shortcuts will follow. Anonymous, 12 Nov 2012Its capable? 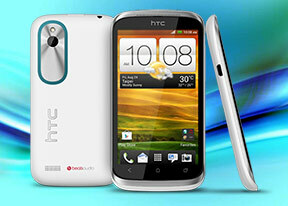 So outperformed by the cheaper Galaxy Ace 2 and Xperia U and Sola, and the only p... moreHTC Desire X looks much better than Samsung Ace 2, its maybe old HTC design, but still it's compact and better design than Ace 2. It has biger and better display and it has "impressive audio quality". Only real disadvantages are low resolution of video recording and lack of front camera. This cell phone shows perfectly what is wrong with HTC for more than a year. Good luck selling poor speced phones with high prices. No wonder that HTC sales, revenues, and profits are going down very fast. I am an ex iphone 3gs owner & I am going to buy this phone. I have a very tight budget & I really don't remember any other mid range phone whom gsm arena praised for churning out perfectly clean & impressive sound quality. 2. Cortex A5's at higher price than the A9's in Ace2, Sola and U. 3. HTC Sense to assure lags and hiccups. 2. Cortex A5 at a higher price than the A9's in Ace2, Sola and U. Very clear win for the Ace 2 here, cheaper and better. Im interested in phones in this class coz my wife is changing her phone, all the research and reading i do points us towards Galaxy Ace 2, or Xperia U if she can live with 6GB storage. Design: Ace 2 has very rounded shape, unlike the Galaxy S Advance it does not look like a cheap iphone3 copy. Desire X design is typical old boring HTC design, outdated. Only advantage i see with Desire X is its display, SLCD is very good. gsmarena, desire x has a notification led. it's located on top right corner. I'm using kakao talk and notification led will blink when new message arrived. I agree with that back metallic plate surrounding camera & flash, it's too out of place, and beware tho, it can deliver small electric current. if I connect my htc dx to my old pc using usb cable, then I touch that back metallic plate, sometimes I got small electric shock. yea my old pc has bad grounding, that's why I always avoid phone with metal housing.. It's so HTC, releasing a capable midrange without front facing camera. Are they not aware of skype, tango, google hung out, etc..... they never made a complete midrange phone. Go Samsung! The fickleness that HTC shows towards its own products is mind boggling. How do you expect your customers to take you seriously? Instead of spreading yourself so thin, maybe you should concentrate on making existing customers happy. I have been a strong supporter for a long time and it pains me to see all your potential being squandered like this. Wake up and smell the roses. Samsung would not be where it is if you do your homework. 4 inch screen? Really? This is.so 2010. Quite agree.. A very good phone overall (well for me no front cam is not a big deal).. The Galaxy S11 leaves this for dead and how old is that! I bet this will have poor battery life. HTC phones prefer thinness even if it means sacrificing battery.